Curing the Christmas Money Hangover. Christmas is by its very nature a time to indulge. We set aside our worries, eat more than we should, attend a few too many parties, and despite our best intensions spend more than we planned. The problem with any indulgent behaviour is that, overdone, it leads to the inevitable hangover. For Christmas spending that time comes in and around the end of January when all the credit card bills start to arrive and it may be time to start thinking about a professional debt management program. In my work as a bankruptcy trustee at Hoyes, Michalos & Associates I see a dramatic rise during the first few months of the New Year in the number of people calling us, looking for help to deal with their debt. Many were already struggling with heavy debt payments before the holidays, and now the situation is overwhelming. Emotionally they are exhausted, feel stressed and basically are at their wits ends. Just like any hangover. The cure is to take action that will be long lasting. It’s not enough to keep ahead by making minimum payments and keeping the collection agencies at bay. Yes, you need to address the current crisis, but more you need to have a solution that will make sure next Christmas is a happy one, both emotionally and financially. 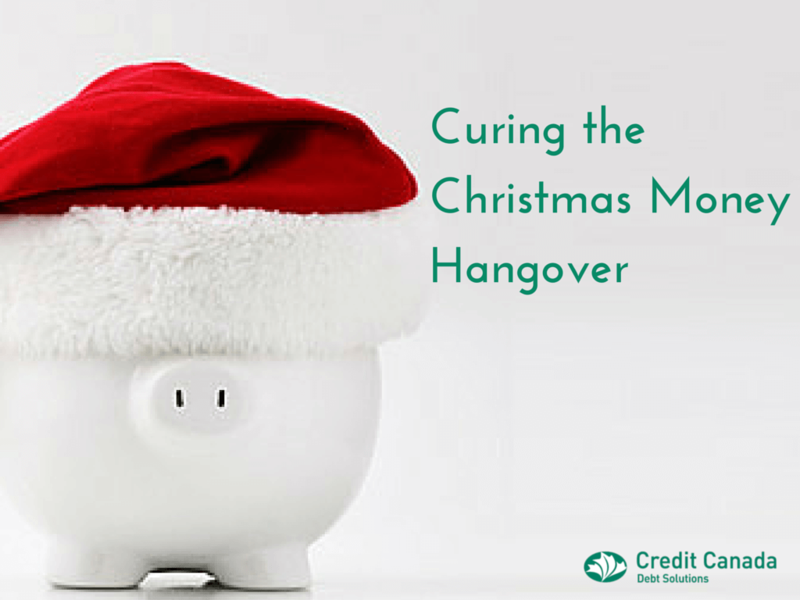 So you can reach that goal, here are 4 ways to help you recover from your Christmas financial hangover. 1. Stop using credit. You’ve already overcharged during the holidays. It’s time to quit, cold turkey. Don’t put any more balances on your credit cards until you have your existing balances paid off in full, period. Credit card interest adds to the cost of everything you buy. Make a New Year pledge to yourself to stop paying extra for everything you buy because you are using credit cards to pay for it. 2. Budget. If you don’t have one, it’s time to make a budget. If you do, it’s time to dust it off and look at it through a microscope. While keeping up with your rent or mortgage, food and living costs are clearly a priority, everything else needs to be considered a luxury while you still owe money on credit cards. As long as you are paying 19% or more in interest on any balances, everything you spend money on has an opportunity cost in terms of debt repayment. Spend $100 on dinner and leave that balance for a year longer – it just cost you $119. Cut back on anything you can in order to increase the amount of money you can put towards debt repayment. 3. Pay more and pay often. Make the minimum payments on all of your debts, and put any extra money you can generate towards the highest interest debt first. Another trick is to make multiple payments every month. As soon as you have some extra money, put this against your credit card balances. Credit cards charge interest on daily balances so the faster you make payments, the less interest you pay and the faster you pay them off. 4. Consider getting help. If you are looking at years to repay your debts as is, or perhaps not at all, then it’s time to consider other options. What type of help you may need will depend on how severe your situation. Here are three debt relief options you may want to consider that will help you repay your debts with less interest. Debt consolidation loan. If all you need is a reduced interest rate, talk to your bank about a debt consolidation loan. What is a debt consolidation loan? A debt consolidation loan allows you to take some or all of your debts and combine them into one new loan. The objective is to lower your interest costs so you can pay off your debt sooner and make paying easier with one payment instead of several. You can pick and choose which debts to consolidate but you will have to qualify. It’s also important to know that this does not eliminate your debt, it just replaces it with a different debt. You have to be diligent to keep up with the payments, and not borrow more money against your old credit cards. Debt Management Program. If you don’t qualify for a debt consolidation loan or can’t get one at a reasonable interest rate due to poor credit, then a debt management program is worth discussing with the not-for-profit credit counselling agency, Credit Canada Debt Solutions Inc. A debt management program can provide interest relief which will help you get out of debt faster but you will need to be able to afford to pay back your debts in full over a period of 3 to 5 years. You can not pick and choose which debts to include- all debts must be included. There are exceptions but this is a decision that the counsellor makes. Counsellors may have to leave some debts off the program for very specific reasons: co-signed debts, secured debts, student loans in good standing, etc. The advantage is one, lower monthly payment and you can benefit from budgeting advice provided by your credit counsellor. A note that you have entered into a debt repayment program will appear on your credit report with a credit rating of R7 and will remain there for 2 years after you complete your payments. Consumer Proposal. If you can’t afford to repay your debts in full, then it’s time to consider a consumer proposal. Filed through a bankruptcy trustee, you only have to pay back a portion of what you owe. With your trustee, you can negotiate a settlement plan with your creditors and spread your payments over a period of up to 5 years. Since this is a legal process under the Bankruptcy and Insolvency Act you must include all your unsecured creditors however all creditors must participate once the plan is accepted. A consumer proposal is the only debt settlement option that provides a stay of proceedings that automatically stops a wage garnishment or other legal action by your creditors. Like a debt management plan a note will remain on your credit report for 3 years after you complete your payments. Personal Bankruptcy. In certain circumstances it may be necessary to file for bankruptcy to eliminate debts you have no possibility of being able to repay. If you have few assets and do not have sufficient income to afford a consumer proposal, bankruptcy can be an option and assuming this is your first bankruptcy you can be eligible for discharge in as little as nine months. A bankruptcy will remain on your credit report for 6 to 7 years after your discharge (depending on the credit bureau) but you can begin the process of rebuilding your credit much sooner. Just like any hangover, we always seem to promise we won’t overindulge so much again but that takes commitment. No matter how you pay off your debts, on your own, with the help of a credit counsellor or a bankruptcy trustee, make a New Year’s resolution to yourself not to overuse credit again. Keep your budget current, don’t use credit cards unless you can pay the balance in full each month and start now planning and saving for next Christmas. Doug Hoyes is a Licensed Bankruptcy Trustee and co-founder of Hoyes, Michalos & Associates. He is also a Chartered Professional Accountant (CPA), Chartered Insolvency and Restructuring Professional and Business Valuator. He regularly comments on a variety of TV, radio and other media outlets on topics surrounding bankruptcy and writes a column for the Huffington Post. Hoyes has been a Licensed Trustee since 1995 and has testified before the Canadian Senate’s Banking, Trade and Commerce Committee in 2008.